There is a long connection between Saybrook and systems conversations, which continues to this day. The semi-annual conversations have been hosted by the International Federation for Systems Research (IFSR), and were historically known as the Fuschl Conversations (due to their location at Fuschl am See in Austria). Bela Banathy, the founder of the systems program at Saybrook, initially led these conversations. He extended the conversations through the International Systems Institute, based in the US, hosting annual conversation events at Asilomar, in Pacific Grove, CA. Bela brought me into the IFSR where I have served as part of the Executive Committee since 2002, and President since 2010. Doug Walton has served as president of the ISI for many years. The seventeenth IFSR conversation was held this past April in Linz, Austria. It was the largest conversation that the IFSR has hosted to-date, with 42 participants working in six teams. 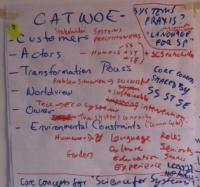 The topics on which the teams chose to focus spanned a wide range of systems concerns, from the philosophy of systems to the principles of the conversation itself. One team considered the future of cybernetics, and another continued work on applications and models in systems engineering. A fifth team continued work on “curating the conditions for the emergence of thrivable systems.” The sixth team addressed the issue of systems research—ranging from what systems research is to the method(s) that a legitimate systems research project should ideally follow. The outcomes from each team will be published in the official proceedings of the conversation in the fall of 2014. For this post, I would like to focus on the work of the systems research team and its relevance to Saybrook work. Not surprisingly, the conversation raised many long-standing questions and issues, even as to what the term systems research means or includes. Some researchers approach this in terms of studying systems as entities, meaning looking for principles which might be unique to systems (such as emergence, self-organization, feedback, etc.) Others think in terms of systemic approaches to research, meaning studying properties of whole entities (rather than studying the parts of which they are comprised), of functions and processes, open rather than closed systems, etc. Still others focus specifically on particular methodologies: system dynamics modeling, soft systems methodology, viable systems modeling, action research, etc. Some researchers focus on human systems, and see factors such as participation, inclusion, emancipation, and ethics as necessary ingredients. The work of this team will continue at the upcoming conference of the International Society for the Systems Sciences. This annual ISSS conference will be held July 27 through August 1 in Washington, D.C. The team will present some of their ideas during a plenary session at the conference. The most immediate implications within Saybrook will be reflected in changes to the systems research course (RES1160), which is in the process of being revised. Many of the questions faced by the conversation team are exactly those confronted by students trying to apply systems theories and concepts to their own research. The first change will most likely be framing the course around an action research / action learning model. Ultimately, research is a disciplined process of learning. Framing the course as cycles of learning will hopefully help to make that clearer. The entire research sequence is then just an expanded process of the same cycles. Ockie Bosch and Nam Nguyen use a seven-step cycle in their Living Laboratories for Learning (LLabs), focused primarily on environmental sustainability. Peter Checkland’s Soft Systems Methodology is a slightly different seven-step cycle. Both, though, include the development of maps or models in the cycle. (Those are simply ways of visually capturing what is known about the system of interest, at that point in time.) As a researcher cycles through the process numerous times, the pictures should become increasingly detailed and clear. What I am attempting to describe is just a larger view of a learning and development process. It comes from many years of professional relationships and collaboration. It is probably not that different from “open source” projects in software and technology development, though it may be a bit less formal. It is only the beginning of one cycle, though. The next step is the use and refinement by students and other interested people, as they test first versions of these concepts in practice. Years from now, the benefits of learning more about conducting systems research might show up through better journal articles or more applied impact to the many issues facing us on a global scale.